Dr. Janet F. Roser received her MS degree in Animal Science in 1978 and her PhD degree in Physiology in 1982 while in the Department of Animal Science at UC Davis. She then went on to do a two year post-doctoral fellowship at the Hormone Research Laboratory at the University of California San Francisco Medical Center. Upon completion of the post-doc, Dr. Roser worked in the biotech industry for 2 years after which she returned to the Davis campus as a faculty member in Animal Science studying reproductive endocrinology mainly in the stallion and mare for the next 29 years. While studying hormonal regulation in the stallion, Dr. Roser identified several factors in the testes and epididymis that appeared to act locally on the function of Leydig and Sertoli cells as well as principal cells, respectively. From her studies, she developed a theory that the decline in testicular function in idiopathic subfertility was initially due to dysfunctional Sertoli cells which still holds today. Later, Dr. Roser turned her focus on ovarian function in the mare. With colleague Dr. Irv Boime, University of Washington Medical School, St Louis, she determined the efficacy of recombinant equine follicle stimulating hormone (reFSH) and recombinant equine luteinizing hormone (reLH) on superovulation in the mare. A “use” patent was awarded to Dr. Roser and 3 other colleagues. Dr. Roser published over 120 scientific journal articles during her career. The development of a potential company to market the recombinants is in progress. Dr. Roser taught Horse Husbandry, Horse Production and Management and Equine Reproduction throughout her career at Davis. She developed the Stud and Foal Management Internships at the Horse Barn which have become very popular with the students. Dr. Roser also developed three distance learning courses with Cal Poly and Fresno State. During her career, the equine science program has flourished with 8 equine course taught through Animal Science on the Davis campus. B.S., Medical Technology, University of Vermont, Burlington Vt.,1968. M.S., Animal Science, University of California, Davis, CA 1978 . Ph.D., Neuro Physiology Biology, University of California, Davis, CA 1982 . Post-Doc, Biochemistry, University of California, San Francisco Medical Center, 1984. My present research program addresses the endocrine/paracrine/autocrine events in the My present research program addresses the endocrine events in the mare, stallion, boar, elephant and other exotics that operate to initiate, sustain and regulate target organs. My approach is to investigate the role and mechanism of action of reproductive hormones on inducing a cellular response at the level of the pituitary, gonads and embryo. In addition, we are exploring the paracrine/autocrine system that modulates cellular responses. By understanding the control of normal reproductive events, it will then be possible to elucidate the basis of endocrine dysfunction associated with reproductive failure. 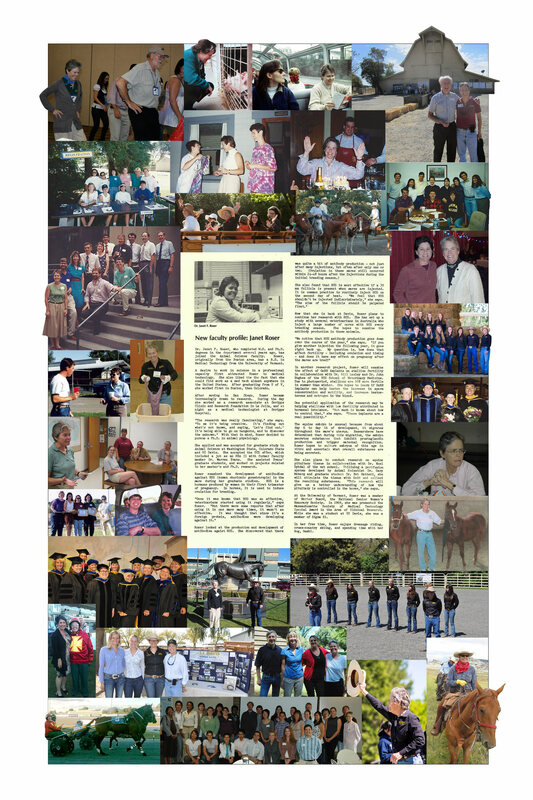 Click the poster below to view the full size.